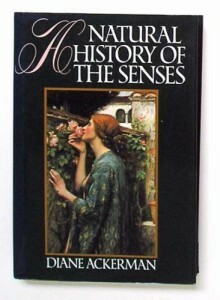 Diane Ackerman's lusciously written grand tour of the realm of the senses includes conversations with an iceberg in Antarctica and a professional nose in New York, along with dissertations on kisses and tattoos, sadistic cuisine and the music played by the planet Earth. "Delightful . . . gives the reader the richest possible feeling of the worlds the senses take in." --The New York Times. (Literature--Classics & Contemporary)From the Trade Paperback edition. Did not finish; I thought it would be a science book but it was not. A loosely-connected farrago of things the author has read or thought about the senses, expressed with verve, sometimes vivid, sometimes ill-considered metaphors. Sadly it could be better. A beautiful book exploring the human senses. It will leave you with a new appreciation for vanilla.